This situation occurs mostly to tile counter top replacement projects. About 99% of the window sills are not the same level as the countertops when we remove the tiles off counters. This is because the tiles sit on adhesive material (thin set or cement) which was built-up to the same level as the sill. The first picture shows how tiles are set on counter tops. Tile counters consist of several layers. 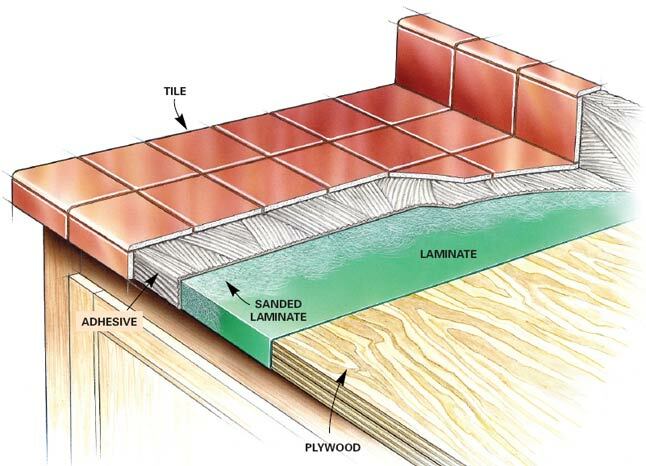 The first layer on top of the plywood is a waterproof membrane or seen as the green laminate. The second layer is the adhesive which is commonly seen as thin set or cement. The final layer is the tile and the grout. The slide show below shows how we installed prefabricated granite pieces on the window sill. This entry was posted in Installation Day, Custom Installations, Kitchen. Bookmark the permalink.